If this is your first Sunday in this church, you are welcome here. If this is your first Sunday in any church, you are welcome here. If you got dragged here by your mom, or aunt, or grandfather or a friend, and are still a little green from last night, you are welcome here. If you have been a faithful member here for the last decade, you are welcome here. If you have sat in the 3rd pew on the left since before Jesus was born, you are welcome here. If duty or joy or grief or fear prodded you to church today, you are welcome here. If you’re running from something, running to something, you are welcome here. If you are here unsure if you should be here, you are welcome here. I’ve never been to this church either- we are strangers here together. Before the tomb, we are all strangers. But at least part of the story of Easter is a story of recognition, a story of hearing someone call out our name, a story of being known. And whether you believe a little or believe a lot, you are here. You are welcome here. It is good that you are here. We’ve got work to do together. The Easter story in John’s gospel is a big of a theatrical mess. People are moving back and forth in ways that aren’t totally clear. The big dramatic scene has happened off stage, beyond our sight- the stone has been rolled back, the burial shroud comes off, the broken body laid to rest arises. All that happens off stage in John’s Gospel. What we do see is the running. Unlike the other three Gospel stories of the Resurrection, John’s Gospel starts out in the dark. Not the Easter dawn with the bright morning star arising, but in that inky blue before the sun beings to rise. The moon still hovers in the sky. We are in-between. John’s Easter is for those of us who didn’t get up this morning with the hope of new life. John’s Easter is for those who fumble in the darkness. In that early morning before dawn, Mary walks to the tomb after the violent, humiliating events of Friday’s crucifixion. She walks after the worst days of her life. The very fact she gets up out of bed and steps one foot in front of the other seems to me like a miracle in and of itself. Mary Magdalene walks to the graveyard to pray at the tomb, to grieve all the hope that is lost, but the stone has been rolled away. Heart pounding, she runs from the scene of a crime, unsure of what has happened and what will happen next. She turns around and she runs. First Mary runs from the tomb, then the Beloved Disciple and Simon Peter run there and back, and Mary runs to the tomb again. It’s a relay race of disciples. And relay races are glorious, high stakes but they are messy. But the life of faith is this, We run together. Now almost 20 years after they ran high school track relays, a few old friends of mine can still remember the stomach-churning clang of the metal baton slipping out of their hands and dropping to the track. They still remember the horror of the entire stadium turning to the sound, every heart dropping with the brassy crash. Passing the baton is the most thrilling and horrifying part of the race. There is some evidence that relay races began in ancient Greece, possibly as a way to pass information from one person to another, over a distance further than any one person could go on their own. That baton was either a scroll or a torch, a word or a light passed along. One of my old high school friends now teaches youth track. When she teaches baton passes, they “talk about not running too far out away from your teammate.” You can lead them “out a tiny little bit without straining them past their ability.” But you have to remember that the incoming runner is exhausted, while the outgoing runner is just starting out with fresh legs. 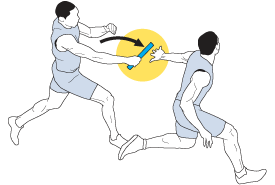 In a blind exchange, the outgoing runner never sees the baton. The incoming runner calls for the outgoing runners hand, and yells “Stick!” You practice that handoff a thousand times so that when the time comes, you can handoff under pressure. Relay teams grow close because they have to rely on one another. Your victory depends not just on your own skill, but on the others who run with you. Even if you’ve never run a relay race, you know this. You know how hard it is to pass along that baton- to prepare your child to go to school on their own, to pass the car keys to your teenager, to give over your writing to an editor who will cut it apart, to hand over an organization you’ve given years of service to, to give over our medical and legal power of attorney as our health fails. Maybe you know how hard it is to pass the baton in church. Maybe you know the dread of straining at the end of your race unsure if you’ve got anyone to had off to. Maybe you know the anxiety of reaching back your hand to find nothing in it. However we pass the baton, whatever baton we pass, the reality is this: to successfully pass the baton, we have to run together. We have to match speeds, just for a moment so that each of us is going at the same pace. We are on each other’s teams. You cannot run to the tomb alone. The Easter story in John offers a point of entry for all of us, however we come to the story today, those of us who run ahead and us who lag behind. “The Beloved Disciple sees and believes. Mary sees yet needs help believing. Peter sees, but he does not yet believe. Peter will come to faith in time.” Gospel writer doesn’t judge any one of these as superior. It’s not a contest between them. We’re on each other’s teams. This is a part of the race we run together. Twice, three times they run to the tomb to try to get their arms around what on earth is going on, because Easter isn’t always a story you hear once and believe. Sometimes you’ve got to keep going back to the tomb to make sure it’s still empty. St Basil the Great, a 4th C Church Father said, “When runners reach the turning point on a racecourse, they have to pause briefly before they can go back in the opposite direction. So also when we wish to reverse the direction of our lives there must be a pause, or a death, to mark the end of one life and the beginning of another.” If you come back next week, you’ll hear the story of Doubting Thomas, because believing that death is truly, truly conquered is hard to believe. We need to hear it again and again. We work it out together. We tend to treat Easter as the culmination, as the big Lenten finale, the time to bring out your good hat, and your big choir piece, and your best sermon. But this is not the end, it’s the beginning. It’s the start gun. It’s 50 days of Eastertide, not a sprint race but a marathon, a marathon that will run right outside your door. We run this race together. In the Orthodox Christian traditions, Easter or Pascha starts the night before, while it’s still dark- more like a Christmas Eve service. You go to church on Saturday night, before there’s any sign of the dawn. The first time I attended an Orthodox Christian Easter service I was totally lost. Completely and utterly lost. It was a sign of honor, but inconveniently, they sat me in the front row. Now the problem with the front row is you can’t sneak a peak at the others around you to see what to do. We each had a candle to wave and a song to sing, but the hymn was in Greek and I had no idea what movements I was supposed to make. We must have sung the Easter hymn 50 times during the liturgy. By the 20th time, I started to get it. “Christos Anesti…” Christ has risen, Christ has risen indeed. Christos Anesti, Allithos Anesti. Χριστός ἀνέστη!” “Ἀληθῶς ἀνέστη!